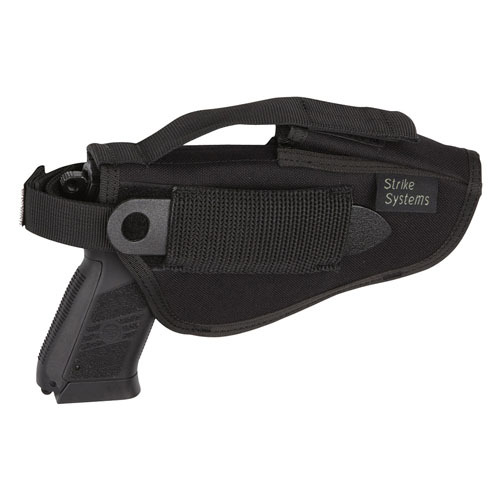 Pistol belt holster with mag pouch. This holster can quickly be changed for either left or right handed players. Retention strap with push button snaps open for a fast draw. A additional safety strap keeps the gun securely in the holster during the most rigorous activities. Abrasion and water resistant nylon exterior construction. Ambidextrous holster. Adjustable double security strap for safe weapon retention. Retention adjustment tool included. Durable nylon webbing. Double stitching at stress points for extra strength and durability. Fits M92, G17/18, STI, CZ and STEYR.